In visible pain, Ashraf shows off his scar. Kidney donors say they gave up their organs for a better life, but found that this wasn't always the case. SULTANPURA, Pakistan (CNN) -- Four years ago Mohammad Ashraf, desperate for money, sold one of his kidneys to repay a debt. The pay-off was 104,000 rupees, which translates to just about $1,800. "My health is suffering, I'm in a lot of pain," Ashraf says as he props himself up on crutches. Now too weak to stand, Ashraf is out of work and ill. He shows us his scar -- all that's left of the debt relief he thought he was getting. "Anyone who has asked me if they should do it, I have told them no. But people like us don't have any other choice," he explains. It's a common story in small rural villages like Sultanpura -- people living in abject poverty looking for an easy way out. In this village alone more than half of the people living here have sold one of their kidneys. In countries like Pakistan where the feudal system still prevails, many like 40-year-old Nazar Mohammad sell their kidneys hoping the money brings with it a better life. "No one does this for fun," says rickshaw driver Nazar Mohammad. "We have all sold our kidneys to pay off a debt so that we can save our families from indentured servitude. There is nothing here, not even water. The land owners keep us oppressed." Mohammad says more than 20 of his relatives -- men and women -- have also sold their kidneys. 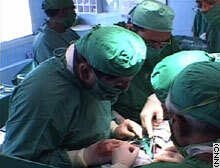 Pakistan is fast becoming a center for the organ trade for foreigners and wealthy Pakistanis in search of a transplant. Transplant specialists estimate thousands of live kidneys are sold here each year. Many hospitals even advertise on the Internet, offering a transplant to anyone who can pay. One such procedure had a price tag of $14,000. Unlike much of the world there are no laws restricting the sale of organs in Pakistan and no regulation requiring informed consent of potential donors. At Pakistan's busiest transplant hospital just a few miles outside the capital Islamabad, the buying and selling of kidneys is a regular practice. The hospital's founder, Col. Mukhtar Hamid Shah, insists that while the majority of donors are paid, ethically the transactions are justified. "I feel this is not the cost of the kidney, this is to encourage so that their economical problems can also be solved. And they are encouraged to donate their organs," Shah says. Regulation and not an outright ban is the key, Shah says. He adds that in a country where 15,000 people sustain renal failure each year, without live donors thousands could die. One example is 16-year-old Rabail Israr. At the age of 11 both her kidneys failed. Through public donations and help from the hospital her family was able to raise enough money to arrange for a transplant. Opponents say the live kidney trade is exploitation. Her father says he was prepared to do whatever it took to save her life. "If someone had come to me and offered to sell their kidney for $10,000 I would have found a way to buy that kidney regardless of if it was wrong, or unethical or even against the law. I would have done anything to save my daughter's life," Israr Ahmed Qureshi says. Opponents of organ sales like transplant surgeon Adib-ul Hassan Rizvi call the buying and selling of organs the worst form of exploitation. "The only people who are benefiting are the middleman and the doctors who are involved in this business," he says. "The poor vendor at the end of the day is the same where he was minus a kidney and psychologically thoroughly broken." Rizvi heads the Sindh Institute of Urology and Transplantation in Karachi, the only transplant center in the country that provides treatment and transplantation free of cost. He is pushing for legislation to outlaw the sale of live organs and for the government to allow doctors to use organs from the dead for transplant purposes -- currently not an accepted practice in many conservative Muslim countries like Pakistan. "After a kidney what else are you going to sell? Liver? Lungs? Eyes? Where is it going to stop?" he asks. Until some sort of transplant legislation is passed, experts say those desperate for money like the poor workers of rural Pakistan -- and those frantically in search of a transplant donor -- will continue to meet and deal in the organ trade.